This report presents an analysis of news and media use in a range of markets in the Asia-Pacific region. It is based on a survey of online news users. 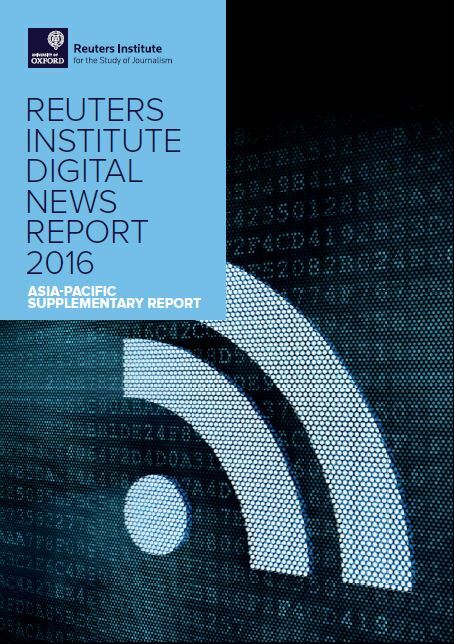 The report expands the work presented in the 2016 Reuters Institute Digital News Report by complementing data from that survey of 26 countries with additional data from a pilot survey of an additional four markets in the Asia-Pacific regions (Hong Kong, Malaysia, Singapore, and Taiwan). We present here an overview of key trends in news media use across these four markets and compare the patterns observed with those found elsewhere in the Asia-Pacific region (Australia, Japan, South Korea) and in selected markets in Europe and North American (the UK and the US) to shed light on similarities and differences.